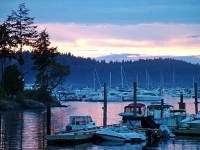 The San Juan Islands form one of the best boater paradises in the world. The hundreds of islands are separated by nationality but are part of the same scenic and rugged archipelago, located off the northwest coast of Washington State. Much of the area is in a rain shadow behind Vancouver Island, making a surprisingly dry and sunny reprieve in the northwest. Little island communities, great wildlife, and the open water provide a real and intuitive disconnect from the mainland. Frequent government ferry services connect the mainland and larger inhabited islands to each other, but others can only be visited by smaller shuttle boats and yachts. Friday Harbour is San Juan's largest town and an enchanting tourist destination. Anchorages are bustling throughout summer, but largely empty in other seasons. Yacht charters are available out of Bellingham.